This Grommet will get people saying, “Wow, those are some really big lights!” These oversized string lights are a riff on the iconic lights that have lined porches, halls, and trees for decades—only each bulb is almost as big as your head. For how giant these guys are, they’re actually very lightweight and energy efficient. 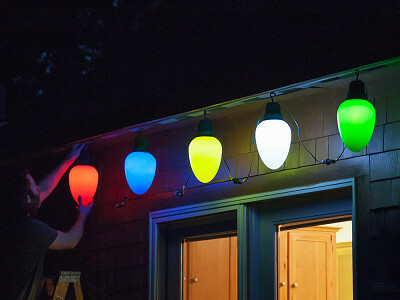 You can string up to 700 to add a “Whoville” vibe or light a single supersized LED bulb for a more “understated” look. Maker Stephen Rouse’s really big inspiration came from a yearly family tradition of making and hanging their own oversized lights. He revamped to make them more affordable and energy efficient—but still super huge. Made with a weather-resistant exterior, the lights give off a warm glow you can pull off inside or out. Each one has an outlet, a plug, and a hook on top that makes them a cinch to hang. Whether you’re slinging them over your porch fence or adding a festive feel to your dorm room—these are bound to be a big conversation starter. Hi Everyone! 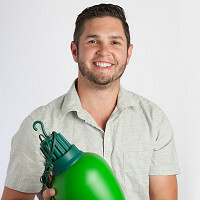 I’m Stephen the Founder and President of Really Big Lights! I am happy to answer any questions that you have! Hey Stephen! I can see some folks I know using these for a very long time. What is the lifetime of the bulbs, and are they replaceable? @Chad Hi Chad! The average lifetime of each LED is 50,000 hours. And when that day comes they are replaceable! Any C9 LED (common in night-lights for your kids) under 0.7Watts will do the trick! Could I get dimensions of each bulb? I am thinking of using them in a photo shoot with my Westie who is my Christmas card cover every year. @Diane Hi Diane, each light is 14.5" tall and 6.55" wide (tapered at it's widest point). Let me know what other questions you have! @Deb Hi Deb, The total length of one string is 41 inches. So, all 5 together span 17 feet! Can I order just white lights? @gina Totally! You can go to the product page here and select "White" from the dropdown menu. I always thought $50+ qualified for free shipping - true? @candice For most orders that is true, but unfortunately we are not able to offer free shipping on Really Big Lights due to the size. Sorry about that! You can see more information on our shipping policies here. @George Each unit counts as 5 Really Big Lights, so every order for 5 will have a $15 shipping cost. Hope this clears that up! So each bulb is $10?? And there are 5 colors? Purple? @Jane :( No purple as of right now. But the sky is the limit with colors. Great idea! You need to sell these at the annual Nutcracker Market in Houston, Texas. Those crowds would eat it up! Everything is bigger in Texas right so why not your Christmas lights. @Janet Are you my first hire?! Is there a timer - on for 5 - off for 18, etc.? @Joann Hi Joann, They do not come with a timer. Though, I have heard reports of customers setting up their own timers with our Really Big Lights. Thanks! @Kathleen Hi Kathleen, No. they are made up of high density plastic. Thanks! Hi Stephen. I love these. I live in a very windy part of town. Can you tell me what these are made out of? If the wind blows them to the house or eaves will they break? @Kristen Hi Kristen, I LOVE to hear it! The lights are made out of high density plastic. Wind will not break them. Though, they may fall in windy situation. In which case I recommend making sure you hang them right! "High density plastic" doesn't really answer her question. @George Hi George. A apologize for being vague. The blow moulds are made of HDPE (high density polyethylene), the inners are made of both nylon and polypropylene. Thanks! These are really cool! Can you get them in just blue? @Karen At this time we only offer them in a set of 5 colors. Sorry about that! Hi Stephen, these are just awesome, what a great idea! Bet you sell zillions of these, best of luck to you! @Margie Thank you! The idea started as a DIY family tradition years ago and they have always been a hit! Wish I could see how they act in complete darkness, how much actual light they put out. Can you see by them in complete darkness? @Emily Great question! I don't believe they are meant to be used as a primary source of light, but @Stephen would have a better idea of how they might work in that environment. @Chad @Emily Hi Emily, Chad is correct in that they are not meant to be used as a primary source. In the dark of night, the light definitely reflects off of the ground. But I wouldn't count on them to help with finding a lost article in the grass outside of your house.. if that makes any sense! We are thrilled to be showcased in the Grommet marketplace today! I wanted to share a bit of background information. This journey began as a business just a year ago. But the product itself has been in the works for years! It started as a family DIY project almost 10 years ago. We had big lights on our house and they were always a big hit in my hometown. After returning from college I knew I wanted to be an entrepreneur and REALLY BIG LIGHTS presented itself as a clear path! And what a journey it has been.. I think of gumdrops on a ginger bread house every time I hang them. They look stellar, are uber efficient, and are even easier to hang. Be the first to sport RBL in your neighborhood! I will be around all day today to answer your questions. @Stephen Gee, I wonder where I would store 700 of these for 11 months ? @Dan What do you mean STORE?! Red, White, and Blue on the 4th. Your favorite team colors during the sports season, what about birthdays, and your patio?! This Grommet will get people saying, “Wow, those are some really big lights!” These oversized string lights are a riff on the iconic lights that have lined porches, halls, and trees for decades—only each bulb is almost as big as your head. For how giant these guys are, they’re actually very lightweight and energy efficient. 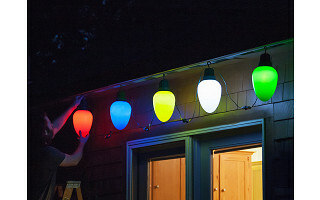 You can string up to 700 to add a “Whoville” vibe or light a single supersized LED bulb for a more “understated” look. Maker Stephen Rouse’s really big inspiration came from a yearly family tradition of making and hanging their own oversized lights. He revamped to make them more affordable and energy efficient—but still super huge. Made with a weather-resistant exterior, the lights give off a warm glow you can pull off inside or out. Each one has an outlet, a plug, and a hook on top that makes them a cinch to hang.